Non-bleed ads should be created to the dimensions (w x h) below. Ads are centered on the page with a white border all around. 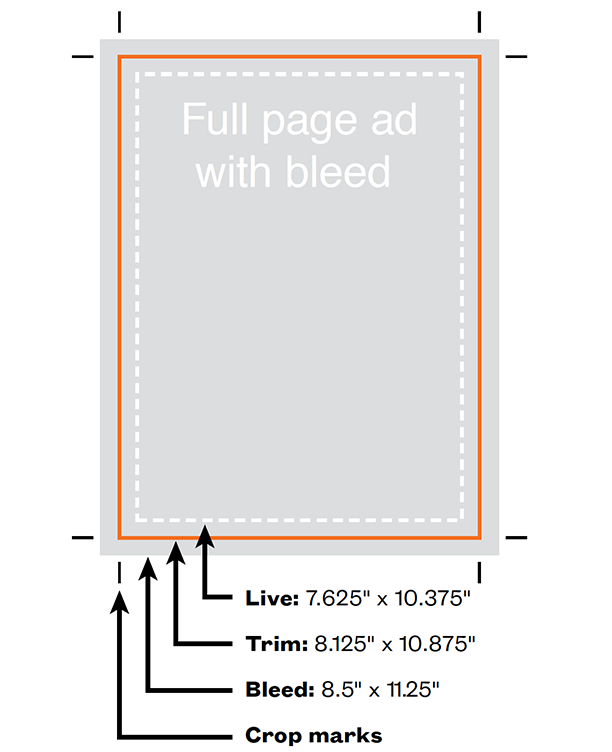 Bleed ads should be created to the dimensions (w x h) below. Live matter — important graphics and text — should be ¼" (.25) from all four sides of the ad. Add an additional 3/16" (.1875) of artwork to all four sides for the bleed. Set crop marks outside the bleed area so they do not print. See diagram below. Full page 6.875" x 9.625" 8.125" x 10.875"
2/3 vertical 4.5" x 9.625" 5.125" x 10.875"
1/2 horizontal 6.875" x 4.75" 8.125" x 5.5"
1/3 vertical 2.125" x 9.625" 2.75" x 10.875"
Two-page spread — 16.25" x 10.875"
Live matter: All live matter — important graphics and text — should be 1/4" (.25) from the trim size on all four sides to ensure that these elements do not get cut off in the finishing process. 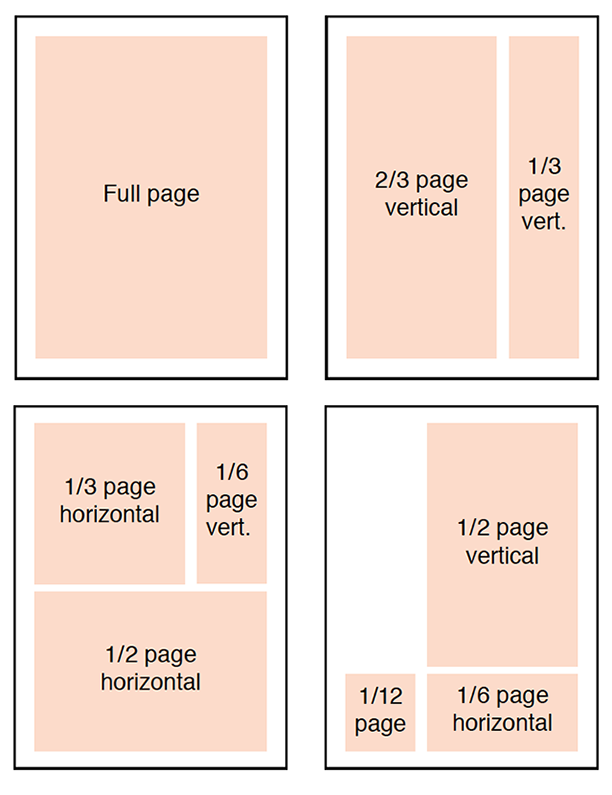 Trim: The orange line indicates the trim size — the size of the finished publication after it is printed and trimmed. Bleed: Bleed equals trim size plus 3/16" (.1875) of artwork on all four sides. This extra 3/16" (.1875) is required to ensure the ad extends all the way to the edges of the finished page. Set crop marks outside of the bleed area so they do not print. Contact the advertising director for production specifications.